There’s an old song by Jim Croce (long deceased) where a character is described as being “… meaner than a junkyard dog”. 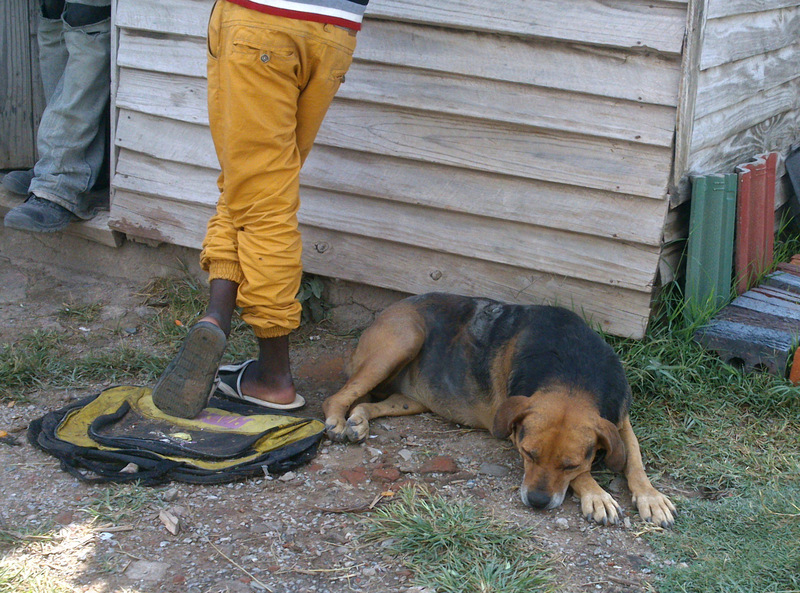 I have no idea why a junkyard dog should be mean as I have never come across one. Ella, or Erra as the Shona speakers pronounce the name, is no junkyard dog. She is old, very over-weight and very gentle and I would think a Lab x Rottweiler. I have being going to the particular pole-yard where she lives on Harare Drive for quite a few years now and she sometimes comes to say hello, her tail wagging gently. Ella has not been badly treated at all by Zimbabwean standards but there has not been a lot of love in her life. I watched on one visit as she walked up to someone her tail wagging expectantly but he didn’t even notice her and her head sagged, her tail dropped and she walked off dejectedly to lie in the sun. So when a couple of weeks back I noticed that she was covered in ticks I decided to do what I could and bought some spot-on Frontline® tick chemical and called in on my way out-of-town. I discovered that no-one actually owns Ella but the person who took responsibility for her was genuinely pleased that I’d gone to the trouble so I showed him the container and applied the contents to Ella. It emerged that she is only fed sadza (cooked maize meal) which would account for her large girth. There was little more I could do except keep an eye on her. I called in yesterday on business and she was sleeping by the building that serves as an office. I couldn’t see any ticks on her and she didn’t respond to my call so I left her dreaming her old dog dreams. As I got in the truck to drive off her “owner” reached down and gave her an unselfconscious pat. She didn’t move.